This page is a translated version of the page Alimentatore and the translation is 100% complete. 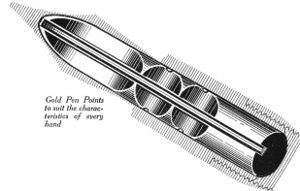 Although it is probably the least important part in the aesthetic aspect of a pen, the feeder (also called conductor or feed) is actually the heart of the functioning of a fountain pen, and on a technical level it is probably the most important component of it. It is in fact the feeder that creates the delicate balance of forces that allows the correct passage of the ink from the tank to the nib that deposits it on the sheet of paper, and a fountain pen writes well because its feeder does its job correctly. The importance of this component is even more evident in the fact that the most important invention of Lewis Edson Waterman, the one that leads many to consider him (with some exaggeration) the father of the fountain pen, is related to the construction of the feeder. Of course, well before concentrating on materials and filling systems at the end of the 1800s, manufacturers were competing (and investing their research efforts) on this very element, which characterized their pens (think, for example, of Parker Lucky Curve or Waterman Spoon feed) since a well-functioning feeder was then what could lead to success or failure. And although later on the importance of the feed, at least in the promotional material, has decreased at the expense of other parts and technical characteristics (and especially compared to the stylistic ones), it is still one of the essential parts of the functioning of a fountain pen, taken up in several cases by the manufacturers (as for the Eversharp Magic Feed or the Lamy tintomatic). Apart from the still very primitive constructions present until the first years of 1900, which still provided for some companies (such as Swan and Onoto) the presence of the so-called overfeed the canonical shape of the feed as an element placed under the nib has been developing quite quickly. 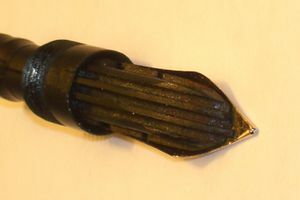 Initially it was simply a cylinder of hard rubber suitably bevelled in the front part placed under the nib to leave space for writing, equipped on the upper part of the "channel" supply through which the ink arrives from the tank to the nib. The first variations occurred precisely in the construction of the channel, and in the addition of further grooves inside to facilitate the passage of the ink by capillarity. Through the same channel the air that replaces the ink that comes out of the pen tank flows (even if later possible alternative paths have been foreseen). The first changes to the simple bevelled cylindrical shape occurred to solve the problem (then very pressing, but which still occurs today) to allow the blocking of the flow of ink when the pen is not used to prevent leakage in the cap. For this reason different solutions were adopted, with as many patents as the famous Lucky Curve of Parker, in which the rear part of the feeder was bent until it touched the wall of the tank, thus favoring (at least according to the claims of the project) the reabsorption of the ink. Other solutions were produced for the same type of problem, such as the creation of appropriate side pockets next to the channel (as in the Spoon feed of Waterman). Over the years, the development of mechanisms has continued, either with the presence of engravings in more or less jagged shapes of the external part (as in the Spear-head of Parker), or with the realization of fins, bags, engravings, channels and other configurations, to allow any excess ink to accumulate properly in the various folds, and avoid dangerous accumulations on the nib, in particular to compensate for pressure changes due to air in the tank, a problem that has become even more significant with the emergence of air travel. Patent n° US-214795, of 1879-04-29, requested on 1879-02-06, of William W. Stewart, Swan. Improvement in fountain-pen holder. Patent n° US-293545, of 1884-02-12, requested on 1883-09-19, of Lewis E. Waterman, Waterman. Fountain-pen. Patent n° US-307735, of 1884-11-04, requested on 1883-06-20, of Lewis E. Waterman, Waterman. Fountain-pen. Patent n° US-311554, of 1885-02-03, requested on 1884-06-26, of Paul E. Wirt, Wirt. Fountain-pen. Patent n° US-314547, of 1885-03-24, requested on 1884-06-30, of William W. Stewart, Swan. Fountain-pen. Patent n° US-330358, of 1885-11-10, requested on 1885-03-02, of Paul E. Wirt, Wirt. Fountain-pen. Patent n° US-345411, of 1886-07-13, requested on 1886-03-18, of Francis C. Brown, Caw's. Fountain-pen. Patent n° US-351033, of 1886-10-19, requested on 1886-08-23, of John A. Holland, John Holland Pen Company. Fountain-pen. Patent n° US-353053, of 1886-11-23, requested on 1886-04-20, of Dewitt C. Demarest, Unbranded. Fountain-pen. Patent n° US-353399, of 1886-11-30, requested on 1886-08-18, of Francis C. Brown, David W. Beaumel, Caw's. Fountain-pen. Patent n° US-358525, of 1887-03-01, requested on 1886-07-28, of Paul E. Wirt, Wirt. Fountain-pen. Patent n° US-361493, of 1887-04-19, requested on 1886-11-06, of Dewitt C. Demarest, Unbranded. Fountain-pen. Patent n° US-374140, of 1887-11-29, requested on 1887-04-15, of Francis C. Brown, Caw's. Fountain-pen. Patent n° US-378987, of 1888-03-06, requested on 1887-04-27, of William W. Stewart, Swan. Fountain-pen. Patent n° US-408000, of 1889-06-30, requested on 1888-11-23, of Dewitt C. Demarest, Unbranded. Fountain-pen. Patent n° US-416944, of 1889-12-12, requested on 1888-12-04, of George S. Parker, The Parker Pen Company. Fountain pen. Patent n° US-422474, of 1890-03-04, requested on 1889-09-27, of Otto E. Weidlich, Weidlich. Fountain-pen. Patent n° US-423804, of 1890-03-18, requested on 1889-09-28, of George S. Parker, The Parker Pen Company. Fountain-pen. Patent n° US-426692, of 1890-04-29, requested on 1889-09-20, of William W. Stewart, Swan. Fountain-pen. Patent n° US-455023, of 1891-06-30, requested on 1890-11-26, of George S. Parker, The Parker Pen Company. Fountain-pen. Patent n° US-480751, of 1892-08-16, requested on 1890-01-20, of William W. Stewart, Swan. Fountain-pen. Patent n° US-485795, of 1892-11-08, requested on 1892-02-29, of John A. Holland, John Holland Pen Company. Fountain-pen. Patent n° US-491795, of 1893-02-14, requested on 1890-05-14, of David W. Beaumel, Beaumel. Fountain-pen. Patent n° US-510439, of 1893-12-12, requested on 1892-12-14, of George S. Parker, The Parker Pen Company. Fountain-pen. Patent n° US-512319, of 1894-01-09, requested on 1893-11-01, of George S. Parker, The Parker Pen Company. Fountain-pen. Patent n° US-533350, of 1895-01-29, requested on 1893-06-14, of Walter F. Cushing, Unbranded. Fountain-pen. Patent n° US-556522, of 1896-03-17, requested on 1895-10-14, of Otto E. Weidlich, Weidlich. Fountain-pen. Patent n° US-559422, of 1896-05-05, requested on 1895-09-27, of Lewis E. Waterman, Waterman. Fountain-pen. Patent n° US-592847, of 1897-11-02, requested on 1897-01-06, of Arthur A. Waterman, A. A. Waterman. Fountain-pen. Patent n° US-603463, of 1898-05-03, requested on 1897-03-26, of David W. Beaumel, Beaumel. Fountain-pen. Patent n° US-606231, of 1898-06-28, requested on 1897-07-26, of George S. Parker, The Parker Pen Company. Fountain-pen. Patent n° US-607397, of 1898-07-12, requested on 1897-08-24, of Lewis E. Waterman, Waterman. Fountain-pen. Patent n° US-607398, of 1898-07-12, requested on 1897-08-24, of Lewis E. Waterman, Waterman. Fountain pen. Patent n° US-607399, of 1898-07-12, requested on 1897-08-24, of Lewis E. Waterman, Waterman. Fountain-pen. Patent n° US-607400, of 1898-07-12, requested on 1897-09-22, of Lewis E. Waterman, Waterman. Fountain-pen. Patent n° US-607401, of 1898-07-12, requested on 1897-09-22, of Lewis E. Waterman, Waterman. Fountain-pen. Patent n° US-610428, of 1898-09-06, requested on 1898-06-30, of Claes W. Boman, Eagle. Fountain-pen. Patent n° US-619701, of 1899-02-14, requested on 1897-03-08, of Arthur A. Waterman, A. A. Waterman, Sterling Fountain Pen. Fountain-pen. Patent n° US-625722, of 1899-05-23, requested on 1898-08-24, of William I. Ferris, Waterman. Fountain-pen. Patent n° US-634398, of 1899-10-03, requested on 1899-08-04, of Dewitt C. Demarest, Eagle. Fountain-pen. Patent n° US-638779, of 1899-12-12, requested on 1899-08-16, of Arthur A. Waterman, A. A. Waterman. Fountain-pen. Patent n° US-648839, of 1900-05-01, requested on 1900-03-10, of Claes W. Boman, Eagle. Fountain-pen. Patent n° US-651735, of 1900-06-12, requested on 1899-10-19, of Paul E. Wirt, Wirt. Fountain pen. Patent n° US-675698, of 1901-06-04, requested on 1900-09-01, of Paul E. Wirt, Wirt. Fountain-pen. Patent n° US-679790, of 1901-08-06, requested on 1901-03-05, of William W. Stewart, Swan. Fountain-pen. Patent n° US-698881, of 1902-04-29, requested on 1896-02-01, of Lewis E. Waterman, Waterman. Fountain-pen. Patent n° US-703418, of 1902-07-01, requested on 1902-03-17, of John A. Holland, John Holland Pen Company. Fountain-pen. Patent n° US-706140, of 1902-08-05, requested on 1901-07-12, of Paul E. Wirt, Wirt. Fountain-pen. Patent n° US-706141, of 1902-08-05, requested on 1901-09-14, of Paul E. Wirt, Wirt. Fountain-pen. Patent n° US-714283, of 1902-11-25, requested on 1901-05-20, of Alonzo T. Cross, Cross. Fountain-pen. Patent n° US-723112, of 1903-03-17, requested on 1902-01-16, of Paul E. Wirt, Wirt. Fountain-pen. Patent n° US-723113, of 1903-03-17, requested on 1902-04-15, of Paul E. Wirt, Wirt. Fountain-pen. Patent n° US-724983, of 1903-04-07, requested on 1903-01-12, of Paul E. Wirt, Wirt. Fountain-pen. Patent n° US-724984, of 1903-04-07, requested on 1903-01-12, of Paul E. Wirt, Wirt. Fountain-pen. Patent n° US-734563, of 1903-07-28, requested on 1902-12-09, of Frank M. Kegrize, Kegrize. Fountain-pen. Patent n° US-735659, of 1903-08-04, requested on 1903-01-26, of William I. Ferris, Waterman. Fountain-pen. Patent n° US-736710, of 1903-08-18, requested on 1903-06-16, of William I. Ferris, Waterman. Fountain-pen. Patent n° US-750271, of 1904-01-26, requested on 1902-09-04, of August Eberstein, Boston Pen. Fountain pen. Patent n° US-750546, of 1904-01-26, requested on 1903-04-16, of Frank M. Kegrize, Kegrize. Fountain-pen. Patent n° US-757664, of 1904-04-19, requested on 1903-07-28, of Frank M. Kegrize, Kegrize. Fountain-pen. Patent n° US-760829, of 1904-08-02, requested on 1904-05-16, of Otto E. Weidlich, Weidlich. Fountain-pen. Patent n° GB-190407468, of 1904-08-18, requested on 1904-04-29, of Frank M. Kegrize, Kegrize. Improvements in Fountain Pens. Patent n° US-768216, of 1904-08-23, requested on 1904-06-25, of August Eberstein, Boston Pen. Fountain-pen. Patent n° US-771360, of 1904-10-04, requested on 1904-02-03, of August Eberstein, Boston Pen. Fountain-pen. Patent n° US-776428, of 1904-11-29, requested on 1904-01-29, of Julius L. Schnell, Schnell, Bankers. Feeder-bar for fountain-pens. Patent n° US-778997, of 1905-01-03, requested on 1904-04-09, of George S. Parker, The Parker Pen Company. Feeder for fountain-pens. Patent n° US-803866, of 1905-11-07, requested on 1904-12-06, of William A. Welty, Welty. Fountain-pen feed. Patent n° US-810284, of 1905-12-12, requested on 1905-03-20, of Frank M. Kegrize, Kegrize. Fountain-pen. Patent n° US-819719, of 1906-05-08, requested on 1905-07-07, of Francis C. Brown, Caw's. Fountain-pen. Patent n° US-834541, of 1906-10-30, requested on 1906-01-18, of William A. Welty, Welty. Fountain pen. Patent n° US-844575, of 1907-02-19, requested on 1905-12-11, of John S. Barnes, Unbranded. Fountain-pen. Patent n° US-844576, of 1907-02-19, requested on 1906-04-10, of John S. Barnes, Unbranded. Fountain-pen. Patent n° US-848620, of 1907-04-02, requested on 1905-12-18, of John S. Barnes, Unbranded. Fountain-pen. Patent n° US-900833, of 1908-10-13, requested on 1906-08-21, of Alonzo T. Cross, Cross. Fountain-pen. Patent n° US-910980, of 1909-01-28, requested on 1908-03-28, of Edward V. Whiton, Williamson Pen Co. - Williamson Torino. Feed-bar for fountain-pens. Patent n° GB-190823642, of 1909-09-02, requested on 1908-11-05, of Duncan Cameron, Albert Edward Wright, Cameron. Improvements in or relating to Fountain Pens. Patent n° US-978420, of 1910-12-13, requested on 1908-10-31, of Paul E. Wirt, Wirt. Fountain-pen. Patent n° US-990288, of 1911-04-25, requested on 1910-06-16, of George S. Parker, The Parker Pen Company. Fountain-pen. Patent n° GB-191129078, of 1912-11-14, requested on 1912-06-13, of August Eberstein, Ernest M. Wade, Lang - Curzon - Summit. Improvements in or relating to Self-filling Fountain or Reservoir Pens. Patent n° US-1046821, of 1912-12-10, requested on 1912-05-03, of William L. MacDonald, Moore Pen Company. Fountain-pen. Patent n° US-1080176, of 1913-12-02, requested on 1912-01-09, of Richard H. Stevens, Waterman. Fountain-pen. Patent n° US-1151980, of 1915-08-31, requested on 1912-02-17, of De Witt C. Van Valer, A. A. Waterman. Fountain-pen. Patent n° US-1201951, of 1916-10-17, requested on 1914-06-03, of William I. Ferris, Waterman. Fountain-pen. Patent n° GB-104980, of 1917-03-29, requested on 1916-06-09, of William I. Ferris, Waterman. Improvements in Fountain Pens. Patent n° US-1267624, of 1918-05-28, requested on 1917-03-19, of George F. Brandt, Moore Pen Company. Fountain-pen. Patent n° US-1284525, of 1918-11-12, requested on 1914-06-10, of Russell T. Wing, Unbranded. Fountain-pen. Patent n° US-1347901, of 1920-07-27, requested on 1919-09-08, of William T. Fitzpatrick, Welty. Retarded delivery device for fountain-pens. Patent n° US-1357083, of 1920-10-26, requested on 1916-06-29, of Julius L. Schnell, Schnell. Feed-bar for fountain-pens. Patent n° SE-59425, of 1921-03-30, requested on 1919-11-20, of Theodor Kovacs, Günther Wagner - Pelikan. Reservoarpenna. Patent n° DE-349410, of 1922-03-02, requested on 1920-05-29, of Theodor Kovacs, Günther Wagner - Pelikan. Schreib- oder Zeichengeraet mit Befestigung der Feder durch einen Ring. Patent n° DE-366684, of 1923-01-09, requested on 1920-02-08, of Theodor Kovacs, Günther Wagner - Pelikan. Selbsttaetiger Fuellhalter, insbesondere fuer Stahlfedern. Patent n° NL-11429, of 1924-05-16, requested on 1919-11-21, of Theodor Kovacs, Günther Wagner - Pelikan. Fountain pen. Patent n° US-1498558, of 1924-06-24, requested on 1923-12-20, of Arthur K. Liddell, Corona Pen Company. Fountain-pen ink-feeding device. Patent n° US-1507782, of 1924-09-09, requested on 1920-01-30, of Carl F. Litts, W. A. Sheaffer Pen Company. Fountain pen. Patent n° GB-212564, of 1924-10-09, requested on 1923-03-05, of Louis Badois, Météore - La Plume d'Or. Improvements in and relating to pen-holders. Patent n° DE-406609, of 1924-11-25, requested on 1923-07-17, of Theodor Kovacs, Günther Wagner - Pelikan. Füllhalter mit Füllmöglichkeit durch den ungeoeffneten Halterkopf. Patent n° FR-585289, of 1925-02-24, requested on 1923-07-17, of Theodor Kovacs, Günther Wagner - Pelikan. Porte-plume à réservoir. Patent n° GB-229928, of 1925-03-05, requested on 1923-07-17, of Theodor Kovacs, Günther Wagner - Pelikan. Improvements in or relating to fountain pens. Patent n° FR-590697, of 1925-06-20, requested on 1924-01-08, De La Rue - Onoto. Perfectionnements aux porte-plume réservoirs. Patent n° FR-593376, of 1925-08-21, requested on 1925-02-07, of Yves Zuber, Stylomine. Fixation et alimentation d'une plume de porte-plume réservoir. Patent n° US-1574929, of 1926-03-02, requested on 1922-04-01, of Robert T. Pollock, John Hancock. Fountain pen. Patent n° US-1574930, of 1926-03-02, requested on 1924-04-18, of Robert T. Pollock, John Hancock. Fountain pen. Patent n° US-1624554, of 1927-04-12, requested on 1925-07-13, of Theodor Kovacs, Günther Wagner - Pelikan. Reservoir Pen. Patent n° DE-443893, of 1927-05-12, requested on 1925-07-13, of Theodor Kovacs, Günther Wagner - Pelikan. Füllfederhalter mit abnehmbarer Feder. Patent n° GB-270915, of 1927-05-19, requested on 1925-07-13, of Theodor Kovacs, Günther Wagner - Pelikan. Improvements in Reservoir Pens. Patent n° US-1633111, of 1927-06-21, requested on 1925-07-11, of Theodor Kovacs, Günther Wagner - Pelikan. Reservoir pen. Patent n° US-1633896, of 1927-06-28, requested on 1923-07-17, of Theodor Kovacs, Günther Wagner - Pelikan. Fountain pen. Patent n° DE-447572, of 1927-07-30, requested on 1923-07-17, of Theodor Kovacs, Günther Wagner - Pelikan. Füllhalter. Patent n° US-1724107, of 1929-09-13, requested on 1923-02-17, of Robert T. Pollock, John Hancock. Fountain pen. Patent n° US-1750410, of 1930-03-11, requested on 1928-04-11, of Theodor Kovacs, Günther Wagner - Pelikan. Reservoir pen. Patent n° US-1811874, of 1931-06-30, requested on 1929-01-30, of Edward C. Berry, Chilton. Fountain-pen. Patent n° US-1818743, of 1931-08-11, requested on 1929-09-26, of Kenneth S. Parker, The Parker Pen Company. Adjustable feed for fountain pens. Patent n° DE-544477, of 1932-02-18, requested on 1929-04-20, Montblanc. Tintenzuführer. Patent n° US-1853731, of 1932-04-12, requested on 1929-08-19, of Theodor Kovacs, Günther Wagner - Pelikan. Reservoir pen. Patent n° US-1882644, of 1932-10-11, requested on 1930-08-16, of Louis H. Juster, Waterman. Feed for fountain pens. Patent n° US-1908123, of 1933-05-09, requested on 1929-07-22, of William R. Cuthbert, W. A. Sheaffer Pen Company. Fountain pen construction. Patent n° US-1950364, of 1934-03-06, requested on 1932-09-26, of William E. Moore, The Parker Pen Company. Fountain pen feed. Patent n° FR-774950, of 1934-12-17, requested on 1933-09-12, Paillard. Perfectionnements aux porte-plume à réservoir. Patent n° DE-625889, of 1936-02-17, requested on 1935-04-09, Kaweco. Tintenleiter fuer Fuellfederhalter. Patent n° FR-795155, of 1936-03-07, requested on 1935-09-21, Paillard. Porte-plume réservoir. Patent n° BE-422774, of 1937-08-31, requested on 1937-03-11, of William F. Johnson, Mentmore. Perfectionnements aux porte-plume réservoirs. Patent n° US-2107150, of 1938-02-01, requested on 1935-09-21, of William F. Heising, W. A. Sheaffer Pen Company. Fountain pen. Patent n° US-2107162, of 1938-02-01, requested on 1935-09-21, of Henry H. Polk Jr., W. A. Sheaffer Pen Company. Fountain pen. Patent n° US-2110578, of 1938-03-08, requested on 1935-09-21, of Aloysius L. Prasch, W. A. Sheaffer Pen Company. Fountain pen. Patent n° US-2129134, of 1938-09-06, requested on 1936-07-21, of William F. Johnson, Mentmore. Self-filling sac pen. Patent n° FR-824603, of 1938-09-06, requested on 1936-07-21, Mentmore. Perfectionnement aux stylographes. Patent n° GB-491876, of 1938-09-12, requested on 1937-03-11, of William F. Johnson, Mentmore. Improvements in or relating to fountain pens. Patent n° US-2144296, of 1939-01-17, requested on 1938-02-25, of Ryosuke Namiki, Pilot. Fountain pen. Patent n° FR-841365, of 1939-05-17, requested on 1938-01-20, Stylomine. Nouveau «conduit d'encre» pour stylographe. Patent n° US-2223541, of 1940-12-03, requested on 1939-01-06, of Marlin S. Baker, The Parker Pen Company. Fountain pen. Patent n° GB-534657, of 1941-03-13, requested on 1939-01-06, The Parker Pen Company. Fountain pen. Patent n° FR-862566, of 1941-03-14, requested on 1937-06-07, The Parker Pen Company. Stylographe. Patent n° US-2241865, of 1941-05-13, requested on 1939-12-28, of Lynn P. Martin, Herman K. Stempel, W. A. Sheaffer Pen Company. Fountain pen. Patent n° GB-537269, of 1941-06-16, requested on 1937-06-07, The Parker Pen Company. Fountain pen. Patent n° US-2255093, of 1941-09-09, requested on 1940-07-01, of George E. Ziegler, Wahl Eversharp. Fountain pen. Patent n° US-2282840, of 1942-05-12, requested on 1941-10-03, of Russell T. Wing, The Parker Pen Company. Fountain pen. Patent n° US-2283333, of 1942-05-19, requested on 1941-05-22, of Lynn P. Martin, W. A. Sheaffer Pen Company. Fountain pen. Patent n° US-2292381, of 1942-08-11, requested on 1940-12-24, of Henry C. Klagges, Esterbrook. Fountain pen feed. Patent n° US-2303373, of 1942-12-01, requested on 1941-11-03, of Lynn P. Martin, W. A. Sheaffer Pen Company. Fountain pen. Patent n° FR-879582, of 1943-02-26, requested on 1941-02-22, Stylomine. Nouveau conduit d'amenée d'encre pour stylographe. Patent n° US-2316479, of 1943-04-13, requested on 1942-08-27, of Norman E. Weigel, Wearever. Fountain pen. Patent n° FR-51854E, of 1943-05-24, requested on 1941-11-29, Stylomine. Nouveau conduit d'amenée d'encre pour stylographe. Patent n° US-2328143, of 1943-08-31, requested on 1942-06-27, of Benjamin W. Hanle, Eagle. Fountain pen. Patent n° US-2337343, of 1943-12-21, requested on 1941-04-01, of John William Para, Wearever. Pen. Patent n° US-2380763, of 1945-07-31, requested on 1944-10-14, of David Juelss, Esterbrook. Feed for fountain pens. Patent n° US-2398521, of 1946-04-16, requested on 1944-01-20, of George D. Cloutier, Wahl Eversharp. Fountain pen. Patent n° US-2417861, of 1947-03-25, requested on 1945-01-09, of Arthur O. Dahlberg, The Parker Pen Company. Fountain pen. Patent n° GB-595436, of 1947-12-04, requested on 1945-05-23, The Parker Pen Company. Fountain pen. Patent n° GB-612956, of 1948-11-19, requested on 1946-06-11, of William F. Johnson, Mentmore. Improvements in or relating to fountain pens. Patent n° CH-260100, of 1949-02-28, requested on 1945-06-28, The Parker Pen Company. Fountain pen. Patent n° US-2474996, of 1949-07-05, requested on 1945-10-12, of Frank B. Wallis, W. A. Sheaffer Pen Company. Fountain pen. Patent n° US-2519966, of 1949-07-12, requested on 1946-06-11, of William F. Johnson, Mentmore. Fountain pen. Patent n° FR-947791, of 1949-07-12, requested on 1946-06-11, of William F. Johnson, Mentmore. Perfectionnement à la construction des stylographes à réservoir. Patent n° US-2512004, of 1950-06-20, requested on 1945-03-05, of Russell T. Wing, The Parker Pen Company. Fountain pen. Patent n° GB-646726, of 1950-11-29, requested on 1947-03-03, The Parker Pen Company. Improvements in or relating to fountain pens. Patent n° FR-969966, of 1950-12-28, requested on 1947-03-03, of Floyd E. Bartell et al, The Parker Pen Company. Stylographe aver reservoir d'encre remplissable par capillarité. Patent n° CH-274547, of 1951-04-15, requested on 1947-03-03, The Parker Pen Company. Füllfederhalter. Patent n° DE-804411, of 1951-04-22, requested on 1946-06-11, of William F. Johnson, Mentmore. Fuellfederhalter. Patent n° DE-811086, of 1951-08-16, requested on 1948-10-06, Uhu. Tintenleiter fuer Fuellfederhalter. Patent n° DE-814572, of 1951-09-24, requested on 1949-05-13, of Gregor Miltner, Faber-Castell. Tintenleiter fuer Fuellfederhalter. Patent n° DE-820253, of 1951-11-08, requested on 1950-03-23, of Emil Gühne et al, Soennecken. Füllfederhalter, bei dem die Feder zwischen der Innenwand des Halterschaftes und des Tintenleiters festgeklemmt ist. Patent n° US-2581739, of 1952-01-08, requested on 1945-03-05, of Russell T. Wing, The Parker Pen Company. Fountain pen. Patent n° DE-828966, of 1952-01-21, requested on 1950-02-02, of Theodor Kovacs, Günther Wagner - Pelikan. Tintenleiter für Füllfederhalter. Patent n° DE-835414, of 1952-03-31, requested on 1950-07-04, of Konrad Kressel et al, Montblanc. Tintenleiter für Füllfederhalter. Patent n° FR-1005485, of 1952-04-10, requested on 1947-07-28, Stylomine. Perfectionnements à la construction des stylographes. Patent n° DE-856114, of 1952-11-20, requested on 1950-08-13, of Josef C. Lamy, Lamy. Fuellhalter. Patent n° US-2619070, of 1952-11-25, requested on 1946-09-19, of Marlin S. Baker, The Parker Pen Company. Ink feed and overflow collector means for fountain pens. Patent n° US-2620774, of 1952-12-09, requested on 1948-06-08, of James A. Mustard, The Parker Pen Company. Fountain pen. Patent n° DE-875462, of 1953-05-04, requested on 1940-06-05, of Emil Wenzel, Soennecken. Tintenleiter mit einem mit Kapillarkanaelen verbundenen Luftkanal fuer Fuellhalter mit durch Druck verstellbarem Fuellkolben. Patent n° DE-882047, of 1953-07-06, requested on 1947-03-03, of Floyd E. Bartell et al, The Parker Pen Company. Fuellfederhalter. Patent n° US-2648309, of 1953-08-11, requested on 1950-09-23, of Floyd E. Bartell, The Parker Pen Company. Fountain pen. Patent n° FR-1037143, of 1953-09-15, requested on 1951-05-16, Stylomine. Régulateur d'écoulement pour distributeur de liquide et notamment pour instrument à écrire. Patent n° DE-894218, of 1953-10-22, requested on 1950-12-15, Fend. Tintenleiter mit Feder fuer Fuellfederhalter. Patent n° DE-907750, of 1954-03-29, requested on 1952-05-06, of Josef C. Lamy, Lamy. Ausbildung und Anordnung der Tintenführung bei Füllhaltern. Patent n° GB-708633, of 1954-05-05, requested on 1950-02-02, of Theodor Kovacs, Günther Wagner - Pelikan. Improvements in fountain pens. Patent n° FR-1071648, of 1954-09-02, requested on 1952-02-13, Stylomine. Dispositif de régulation de l'écoulement de l'encre dans les stylographes. Patent n° GB-729729, of 1955-05-11, requested on 1952-05-01, of Edward Stephen Sears, Swan. Improvements in Nib-Sections for Fountain Pens. Patent n° US-2756722, of 1956-07-31, requested on 1952-05-08, of Josef C. Lamy, Lamy. Fountain pen structure. Patent n° US-2766728, of 1956-10-16, requested on 1950-07-15, of Theodor Kovacs, Günther Wagner - Pelikan. Fountain pen. Patent n° US-2766729, of 1956-10-16, requested on 1951-07-10, of Theodor Kovacs, Günther Wagner - Pelikan. Fountain pen. Patent n° US-2770221, of 1956-11-13, requested on 1951-03-29, of William Tonkowich, Waterman. Fountain pen. Patent n° US-2774333, of 1956-12-18, requested on 1950-12-19, of David Kahn, Wearever. Fountain pen with improved feed construction. Patent n° DE-1034066, of 1957-03-14, requested on 1954-07-26, of Josef C. Lamy, Lamy. Ausbildung und Anordnung der Tintenfuehrung und der Federbefestigung bei Fuellhaltern. Patent n° DE-1034066, of 1958-07-10, requested on 1955-06-29, of Josef C. Lamy, Lamy. Ausbildung und Anordnung der Luftfuehrung und der Federbefestigung bei Fuellhaltern. Patent n° FR-1166468, of 1958-11-12, requested on 1956-10-24, Stylomine. Nouveau conduit support de plume pour porte-plume à réservoir. Patent n° FR-1166469, of 1958-11-12, requested on 1956-10-24, Stylomine. Nouveau conduit d'encre pour porte-plume réservoir. Patent n° US-2881737, of 1959-04-14, requested on 1955-10-24, of Donald H. Young, Waterman. Fountain pen feed construction. This page was last edited on 16 December 2018, at 13:33.